The life of Ray Wilkins had been celebrated with gusto in this arena prior to kick-off, his death marked with the banners in the stands and flowers and a vintage No 8 shirt placed on the assistant manager�s seat in the home dugout. Both sets of fans had warmed to glimpses of the former Chelsea midfielder turned coach in action, clips that spanned eras beamed out over the big screens at either end of the ground, with West Ham�s support bellowing out their own admiration in unison. The tributes were heartfelt and fitting. So it was to the 2016-17 champions� exasperation that their side could not then produce the victory that would have so thrilled Wilkins from his seat just in front of the pressbox. The season-ticket holder would have rejoiced in some of his favourites� attacking play, particularly when they were dominant through a one-sided opening period, and might have enjoyed the frantic intensity of the last quarter-hour once the visitors had plucked parity from nowhere. But, in reality, he would have cursed the fact Chelsea�s campaign is petering out in frustration. This draw left Antonio Conte�s side 10 points off Tottenham with only six games still to play and there was a smattering of boos at the final whistle. Chelsea have won only three league games this calendar year, their prospects of qualifying for the Champions League fading with each hiccup, and the head coach bemoaning the same inadequacies. Profligacy means the gap to fourth widened. That summed it up. 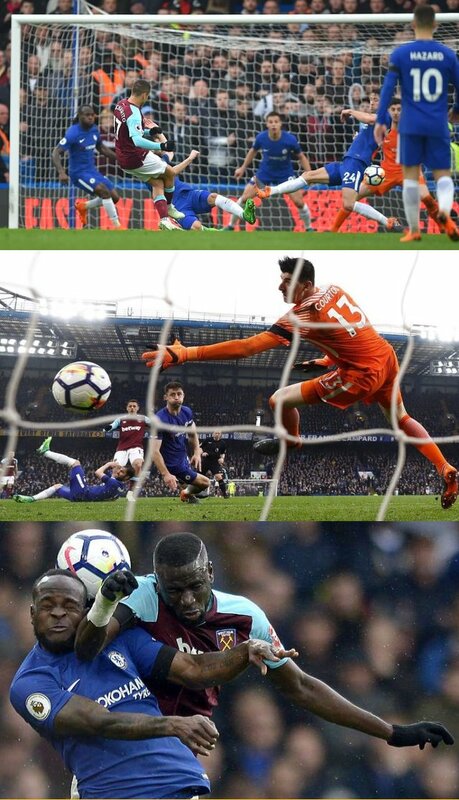 There were hints of brilliance, not least in the zest of Chelsea�s early approach play, which had threatened to sweep aside West Ham, but it was not only Joe Hart�s brilliance that kept the scoreline decent. The home side�s front three seemed to feed off N�Golo Kant�s energy through the centre, the Frenchman a frenzy of interceptions and short passes, cajoling Cesc F�bregas into action at his side. Willian and Eden Hazard were a blur of movement ahead of them and, when they clicked, that combination sliced through their opponents almost at will. Some of their more intricate play took the breath away, summed up when F�bregas slid a pass from deep to prompt a rat-a-tat exchange at pace between Hazard and �lvaro Morata, with the Belgian smartly liberating Willian. Only Hart�s sharp save with his outstretched left leg denied the Brazilian as he bore down on goal. It was a fine intervention � the first of many from England�s current third choice � so to ship a goal from Hazard�s resultant corner, played short, seemed horribly careless on the visitors� part. Victor Moses� centre was looped towards the far post and nodded down far too easily by Morata, in amid grounded opponents. C�sar Azpilicueta duly flicked up and away from a dozy Marko Arnautovic, dangling a leg weakly, with the Spaniard able to poke the loose ball into the far corner from five yards out. West Ham�s defenders had rather stumbled into the concession, concentration lapsing while they marvelled at Hart�s original save. �It was a really poxy goal to concede,� David Moyes offered. Yet, crucially, the visitors survived everything flung at them thereafter. Willian and Moses fired wide. Morata, with goals in his previous two games, was twice rightly flagged offside as he poked home � a reflection perhaps of anxiety as much as eagerness � with the script increasingly predictable. Arnautovic had fluffed the visitors� best first-half opportunity, from Arthur Masuaku�s delicious diagonal, but the Austrian would make his presence felt before the end. Mark Noble launched an optimistic pass into the penalty area 17 minutes from time, with Gary Cahill�s header indecisive, neither a pass to a team-mate nor a clearance, with Arnautovic quick to the loose ball to pull back a centre. There loitered Javier Hern�ndez, a regular scorer as a substitute against these opponents, to fizz a shot inside Thibaut Courtois�s post with his first touch of the contest. Everything in what time remained was frenetic, from Hart�s fine stops to deny Marcos Alonso and Olivier Giroud, to Kant�s timely challenge on Arnautovic, bustling free of the home side�s backline. �Any player other than Kant� wouldn�t have caught up with Marko but I�d rather talk about how well the team kept at it,� Moyes said. �That level of form will be good for Joe, too. We played against a really slick Chelsea team, particularly in the first half, so I�m not disappointed with a draw.� His team are now six points clear of the bottom three and can sense safety. For Chelsea, the frustration merely mounts.